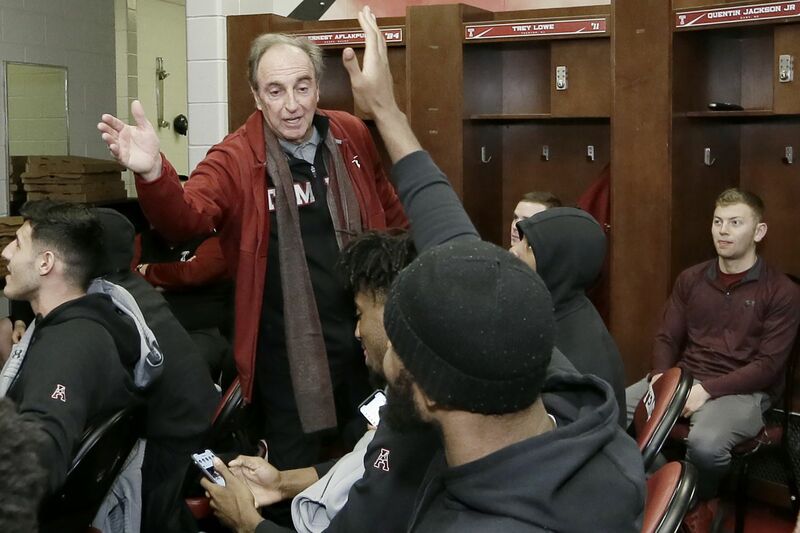 Temple head coach Fran Dunphy high fives members of the Temple mens basketball team shortly after learning they were being included in the NCAA tournament. The team watched the NCAA selection show in their locker room before meeting with the media at Temple's Liacouras Center in Phila., Pa. on March 17, 2019. March Madness, one of the year’s most anticipated sports events, is here. Once again Philly basketball fans will be watching Jay Wright’s Villanova team. For good reason: His Wildcats are the defending NCAA champs and have won two of the last three titles. But I played for Temple and in this tournament, and my eyes will be focused on the Owls, who play Belmont on Tuesday. I will be cheering vigorously for Temple head coach Fran Dunphy. Sadly, it will be his last rodeo at the school— and that will be a compelling narrative during the tournament. Personally, I can’t figure out why he is being replaced. Abruptly last April, and apparently pre-determined, Temple’s athletic administration announced that the 2018-19 season would be Dunphy’s final one on Broad Street. The announcement, sort of, was couched in “retirement” language, though there were hints among some Temple alumni that he didn’t get the Owls into the NCAA tournament often enough and failed to recruit enough blue chip players. I’m not one of those alumni. Dunphy’s ouster was accompanied by the announcement that associate coach Aaron McKie would replace the coach for the 2019-2020 season. Now, believe me, I have nothing against Aaron McKie. I don’t even know him. But I do know Dunphy. The first time I met him, I was impressed by his humility, affability, and uncanny ability to listen to what you had to say. Simply put, he exudes class as a coach and a person. Sure, he’s no saint — but who among us are? Dunphy’s vocabulary can indeed be, uh, colorful during practices and games; he can be inordinately stubborn; and at times he is volatile, particularly when his players make silly mistakes on the court. But undoubtedly, he has coached his way into a cinch induction into the Basketball Hall of Fame, first as Penn’s coach for 17 years and now for the last 13 years as Temple’s leader. The man, even at 70, is still mentally sharp, still confident and competent, and still has a raging fire in his belly for the game. Recently, he hinted to me that he wants to continue coaching somewhere. Take a look at his coaching history: He is one of only 25 active NCAA coaches with 500 victories (310 at Penn, 270 currently at Temple). He is the all-time winningest coach in the history of the Big 5; he has amassed 17 20-win seasons, 17 NCAA appearances, 14 conference championships and eight Big 5 titles; he has won America Athletic Conference Coach of the Year twice and Big 5 Coach of the Year four times. If I were an athletic director looking for a tier one coach, I would hire Fran Dunphy as quick as a snakebite. But, believe me, he’s far more than winning games. Since 2002 he has spearheaded the Philadelphia branch of Coaches for Cancer, and is currently on its national council. He is on the board of directors of Big Brothers/Big Sisters of Greater Philadelphia. Just last year the U.S. Basketball Writers Association bestowed him with the highly prestigious Dean Smith Award, given in honor of embodying the spirit and values of the late, legendary University of North Carolina coach. Perhaps most of all, Dunphy has been a vigilant caretaker of the “Education, not basketball, is your lifeline” philosophy, consistently preaching it to his student-athletes. Unlike many coaches, Dunphy does not run a basketball factory but instead pushes, cajoles and sometimes screams at his players, from the stars to the last guy on the bench, to earn their degrees. He is keenly aware of the fact that only about 60 or 70 college basketball players each year from the 353 Division 1 colleges will make it to the NBA. The other 99 percent will have to get a job. So, yes, it’s difficult to fathom why Fran Dunphy is being replaced at Temple. I’m baffled. And so are a lot of others.